Chatham County is located in the Piedmont region of North Carolina, part of the Research Triangle region. The county seat is Pittsboro. Unlike the other counties in the Triangle, however, Chatham is rural. Whites constitute a strong 75% majority, but unlike most rural white counties, Chatham consistently votes Democrat. Thus, Chatham is politically one of the most interesting counties in the state. Republicans can come close (George W. Bush ended up losing it by only 5 votes in 2004), but Democrats always win. Chatham also elects Democrats to the State House and the State Senate, though Republicans gained control of the County Commission in 2010. Chatham is Democratic because of the influence of Pittsboro, which is a very liberal town due to its proximity to Chapel Hill. The other Democratic area is Siler City, thanks to a large Hispanic population. 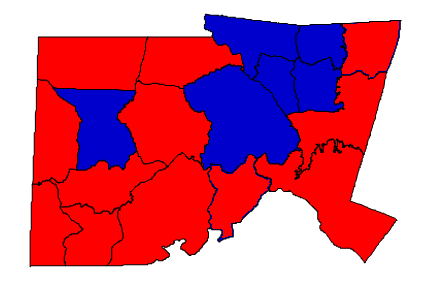 The remainder of the county is rural and ranges from slightly Democratic to strongly Republican. Forecast: Chatham was a strongly Democratic county, but rural voters abandoned the party in droves after Bill Clinton’s first presidential term. Since then, the county has been defined as a ‘toss-up’ but always with a slight Democratic edge. This edge has helped Democrats carry the county in every presidential race since 1984. Notably, Pat McCrory won it by a narrow margin in 2012. It is uncertain what the voting habits of Chatham residents will be in the future. In the 2000s, the county posted a high growth rate of 28.74%. The high rate of growth continues to the present, and a precinct analysis will probably be necessary to ascertain the politics of the new residents. The number of blacks in the county declined, which should help Republicans. But the Hispanic population is still growing strongly. Many new residents of Chatham tend to be retirees, but they could be of a more liberal bent if they are coming from Chapel Hill. The ‘town’ of Cary is also extending itself into Chatham, which is something that needs to be considered. Right now it is projected that Chatham will remain Democratic in the future. With a strong candidate, Republicans have a chance, but the influence of solidly Democratic Pittsboro is often too much for them to overcome.